Join us as a steward of the Ironwood Forest National Monument in support of our work to protect its biology, geology, history, archaeology, recreation, and stunning scenery. Simply fill out the form below to donate online securely using PayPal or if you prefer to send your donation by mail, download our mail-in donation form. which means your donation today is tax-deductible. As an all-volunteer grassroots organization, the Friends of Ironwood Forest depend on your financial support to carry on our mission to restore, conserve, promote and protect the Ironwood Forest National Monument. 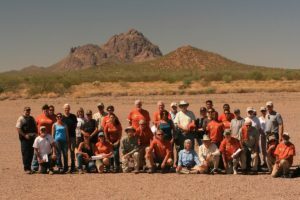 Partner with other conservation and government organizations who share our interests in protecting the Sonoran Desert, which includes the organization of our annual National Public Lands Day volunteer event. Organize our annual Meet The Monument event, seasonal hiking and educational guided tours, and other public events that provide on-site interpretation where there is none. And restoration efforts to reverse damage from as well as provide proper restriction to reduce future damage due to improper off-road vehicle use. Coordinate scientific, cultural and historic research of the Monument and surrounding areas. Assist the BLM with implementation of management plans and mandates aimed toward protection of Monument resources and wildlife conservation efforts. Advocate for the protection and sustainable use of Monument resources, as well as wildlife conservation efforts through communication outreach efforts to the general public, local media, and elected government officials as needed. Develop and distribute educational materials and presentations to educate the general public about on-going conservation efforts as well as promote respectful recreation on the Ironwood Forest National Monument. Advocate for the current and future conservation of national and state public lands. Located a mere 25 miles northwest of Tucson – the Ironwood Forest National Monument protects 129,000 acres of incredible public land recognized for its exceptional scenic beauty, historic value of cultural legacy, biological diversity, and scientific importance. The Ironwood Forest National Monument was established in 2000 by President Bill Clinton with the primary purposes of conservation and protection as part of nearly 32 million-acre National Conservation Lands which are managed by the United States Bureau of Land Management.